How’s This for a $10 Bonsai? | Bonsai Society of Australia Inc.
Home / Beginners Guide / How’s This for a $10 Bonsai? Cotoneasters harden very quickly and it is next to impossible to find a more mature plant with movement enough to make a good bonsai. Therefore, I picked up a $4.50 starter plant at Ray Nesci’s nursery in September, a $5 pot and styled a full cascade. Initially the apical branches were left on as sacrifice branches to hasten the thickening of the trunk but in three months the cotoneaster had developed so well that I decided to keep the top. 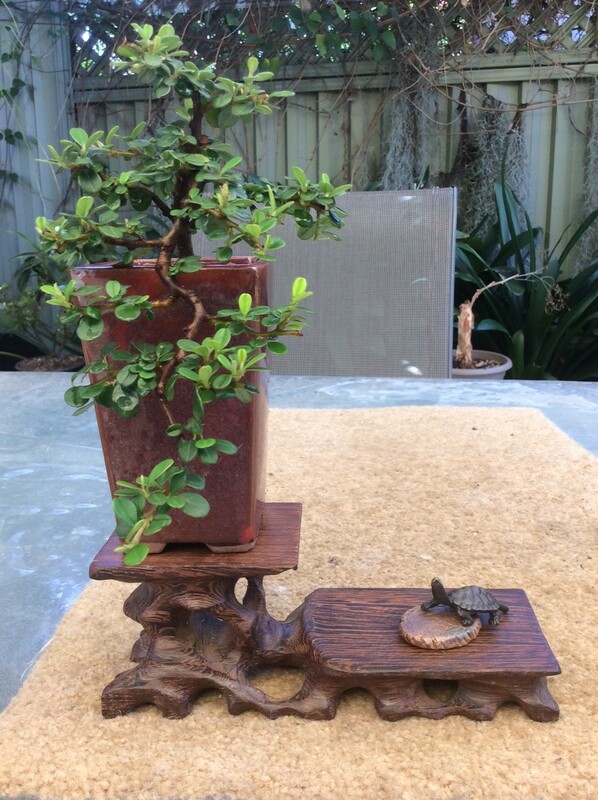 I picked up the stand at Bonsai South and had the turtle and the ceramic ‘rock’ at home. The turtle on the rock was nice but the turtle climbing onto the rock added an element of action to the setting and it looks as though the turtle is climbing up to get a better look at the bonsai. It is hard to believe that a $4.50 starter could develop so quickly into a decent looking bonsai and it is damn good fun to get a tree from scratch to benching in the space of four months. Future growth and development will see this mini cascade greatly improve but already it has charm and style.